I packed up all my gear and headed down to Chicago with new bass player Andy Ferkinhoff to record with producer/engineer Ed Tinley. Past Little Man member, Dave Cottini, joined in on drums once again. Ed has been a part of the past three Little Man albums and both he and Dave are in the Ike Reilly Assassination , a band I used to help out in the past. 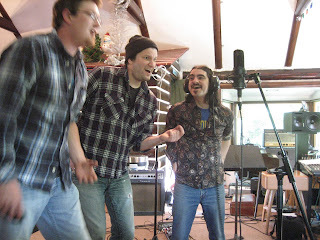 Ike was more than kind enough to let us record at his place. It used to be an old hunting lodge, it’s beautiful. We tracked the band live to tape there and were able to get down basic tracks for 10 songs in two days which is pretty damn good. 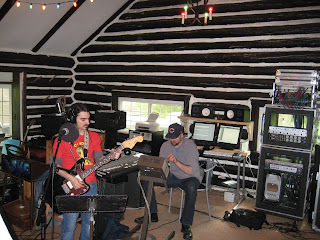 Ike popped in on the second day and introduced a song to us that he’d been working on, so with a few practice passes Ed hit record and we got something down. Really pretty fun to be a part of that. I played slide guitar. The second half of the week was spent at Ed’s place, it’s just a little house on the north end of the city. 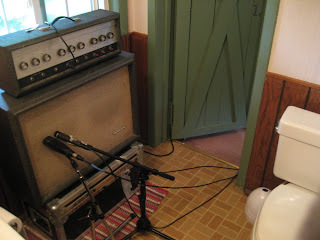 When your tracking guitars and vocals there’s really no need to be in a big studio. Ed has all his equipment there and he really knows how to get some good sounds no matter where we are. We did track some super loud guitar parts that could be clearly heard from across the street, so at a house like this in a neighborhood, we had to be cool with the neighbors once and a while. It’s very comfortable here and it’s great to take a break and cook up a meal or grill out. We’ve easily been doing 10-12 hour days. Ed’s cat Willis is an old grey and white cat that walks around always looking to be pet. Sometimes he’d curl up at your feet while your recording, but we mostly kept him out of the way because he likes to talk once and a while. So things went really good. We are working on 14 songs. Huge vocal parts. I have to go back to track some more later in the summer. In the mean time I got a new band here in St. Paul. 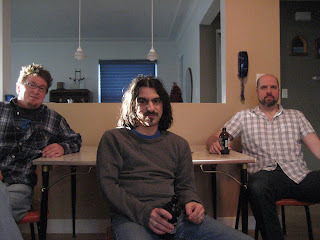 There’s Andy ,as I mentioned above, and drummer Sean Sauder. We’ve been rehearsing a ton to get back on track. My most gracious thanks to Ben and Ryan for making the band sound so great in the past.